Neurodermatitis is a neuro allergic disease of the skin which begins with an itch. It is also known as Lichen Simplex or scratch dermatitis. It is a chronic problem accompanied by itching and scaling. The problem occurs in two forms: Localized neurodermatitis (happens on the face, neck, elbows or knees) and Disseminated neurodermatitis which is also known as atopic eczema. The problem is supposed to be triggered due to stress and anxiety or anything that irritates the skin including tight clothing or bug bites. The problem can be triggered due to injury to the nerve also. Other triggers could be sweat, heat, allergens, poor blood flow etc. The problem is more common in females than in men. It occurs with adults between 30 to 50 years of age. The problem is more common with people who have family history of eczema, psoriasis or other skin disorder. According to Ayurveda, Neurodermatitis is known as Vicharchika and is caused due to unhealthy eating habits and improper lifestyle. It is caused due to aggravation of Pitta energy in the body which in turn vitiates other dhatus and doshas in the body like rakta, mansa and twacha. All this collectively leads to formation of toxins or Ama which further goes deep inside the skin and tissues and leads to Neurodermatitis. It is not a life threatening or contagious problem but it can affect the quality of life, sleep and sexual function in some cases. Severe, uncontrollable itching which makes the skin thick and leathery. The patient tends to develop just 1 or 2 symmetrical patches that itch. Itching is more common while relaxing or when in stressful situation. It might be painful in some conditions. Red, violent or dark, rough, raised patch over the affected area. Bacterial skin infection due to chronic itching, there could be fluid leaking from the area. Pus filled bumps may develop due to infection. Permanent scars can be formed if the wound is deep. Too much itching can cause bleeding of the area. The rubbing causes hair loss on the areas of itch i.e. on the scalp. 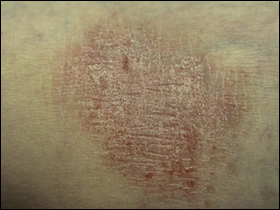 Wet scales and crusts are symptoms of exudative form of neurodermatitis. 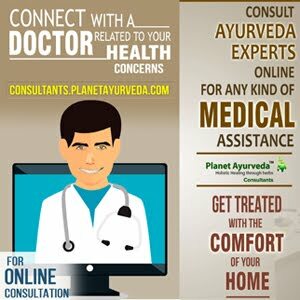 Careful observation and complete medical history helps the doctor to determine the condition. Patch testing or Allergy testing is done. This helps in finding out whether an allergic reaction caused the itching. Biopsy of the affected area is done to confirm the diagnoses and rule out conditions like eczema, psoriasis etc. The treatment of Neurodermatitis focuses on reducing itching and minimizing the existing lesions. Modern Treatment includes steroid based ointments or lotions. To minimize night time scratching, the patients are given sedatives and antihistamines. Antibiotics are prescribed to control inflammation. Light therapy is helpful in some cases. These capsules are formed by the pure extracts of Axadirachta Indica or neem. They act as blood purifier and immunity modulator. Neem is known to be best anti-allergic herb, anti-fungal, anti-bacterial and is very beneficial in all kind of skin problems ranging from skin allergies, rashes, irritation, itching, inflammation and also for respiratory tract infections. Neem is known to have anti-inflammatory properties which can help in reducing inflammation and pain. It has healing and antiseptic properties too, thus the medicines helps in healing wounds and sores. Neem stimulates the production of T cells and gives a head on attack against all kinds of infections. This medicine is useful in problems like acne, eczema, dandruff, psoriasis, hives, herpes, ringworm, shingles, warts etc. This herb contains the constituents azadirachtin, nimbolides, nimbidinin and nimbin. Dosage: The recommended dosage is 2 capsules two times a day with plain water after meals. 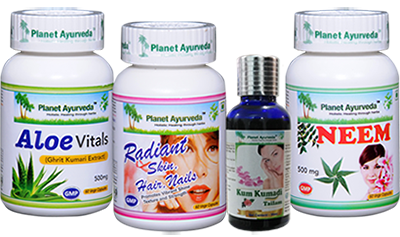 These capsules are prepared using four excellent herbs which include Ghrit Kumara, Manjistha, Chirata and Pitta Papda. As the name suggests, the medicine works towards promoting healthy skin, healthy hair and nails. It is very useful in managing the skin related problems. This serves as a wonderful medicine in treating neurodermatitis. Dosage: The recommended dosage of Radiant skin, hair and nail capsules is 2 capsules two times a day with plain water after meals. These capsules are prepared from the standardized extracts of Aloe Vera herb (Aloe Barbadensis) which is very beneficial in managing skin ailments of all kinds. The medicine is excellent source of Vitamin C and Vitamin E. The product has shown positive results in treating eczema, alleviating red and dry patches, healing wounds and reducing rashes. It helps in stimulating the development of skin cells, keeping the skin hydrated and maintaining skin's natural glow. The herb has anti-inflammatory, antibiotic and antiseptic properties. Dosage: The recommended dosage of Aloe Vital capsules is 2 capsules two times a day with plain water preferably after meals. This herbal oil is an excellent combination of herbs like Rakta Chandan, Manjistha, Yashtimadhu, Daruhaldi, Ushira, Padmaka, Vat, Pipal, Nagkesar, and Til. The oil possesses antiseptic, astringent, disinfectant and deodorant properties. It is safe to be used on any part of the body. It keeps skin glowing, removes acnes, scars and blemishes. It also helps in getting rid of wrinkles. The oil treats uneven skin tones and pigmentation spots. It helps in improving the skin complexion and texture. It provides relief from itching and scratching sensation. Dosage: It is recommended to apply 3 to 5 ml of Kumkumadi Tailam in circular manner over the affected areas daily. Along with the medicines intake of vitamin B is recommended. Regular use of moisturizers helps in reducing dryness of the skin which can further help in reducing the itch. Cool compresses can be done to reduce itching. It is advised to wear loose fitting clothes and stay calm. Try not to touch the affected area often. Cold bath helps in eliminating the itch by reducing the heat in the body.